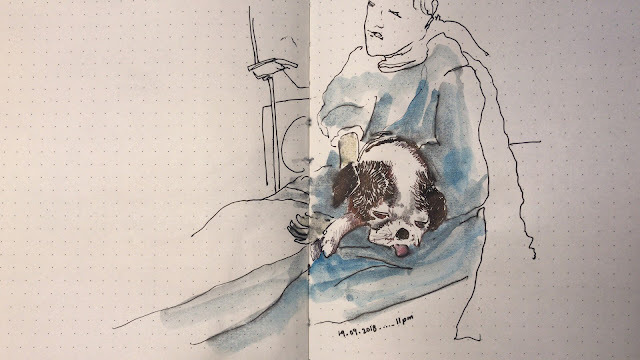 [By Teo Cheng Huat in Beijing, China] Patchy is a french bull and had been with us since 2000 which make him 18 years old this year. Sometimes ago , he had many health issue and infections but every time he sought of recover and becomes better. Since last year, he started limping and eventually cannot walk and only manage to drag himself around the house. He was admitted few weeks ago when more complication appear and treated at a animal hospital near us. It was a Wednesday evening and immediately we finished our dinner, the animal hospital call to inform us that our dog, Patchy is not doing too well and may not make it through the night. We pack up a few of his favorite stuffs and rush down to the hospital. Doctor inform us he had stop eating and drinking. He was excited to see us especially my daughter. We were with him for the last 5 hours, breathing was weak and finally his heart stop at around 11 pm. Suddenly, we misses his noisy barking, his bad breath, how he tear up his bed, how he rub himself on dirty back yard floor and all the mischievous things he did. And then we all feel sad that he had left. R.I.P.